I’ve watched videos, listened to CDs, read Hafner’s book and I continue to be mesmerized. The best film so far has been the 2010 documentary, Genius Within . Gould’s music accompanies me while I chop veggies, sweep the floor, write blog posts. Who was Glenn Gould? He was a Canadian pianist whose ability, style, precision, musicality, phrasing, was simply in a galaxy all his own. Many stories have been told about folks who, having never once listened to classical music, were stunned and converted by some piece they inadvertently listened to on the radio. His playing grabs you. Katie Hafner’s book focuses on the piano that Glenn Gould played, a Steinway CD 318. It’s a great introduction to Gould, but also a great introduction to Verne Edquist, the blind man who was Gould’s principal tuner. In the video linked above, someone has a question, Hafner can’t answer. She calls Edquist in the middle of Q and A and finds out. The Steinways, a German family who emigrated to America to build pianos, provide an engaging back story. Once in a while I try to figure out why Glenn Gould fascinates me. What keeps me looking for more to read, more to watch, more to listen? He is an enigma – charming, yet reclusive, gifted but abhorred performing, confident but lost. I haven’t come up with an answer yet. But I know I’m not alone. His magnetic pull continues thirty-two years after his death. The critic Tim Page said that in his last decade, Gould was “no longer just an arrogant, albeit sweet-tempered genius. He became a sweet-tempered melancholy genius.” Today, September 25th, is the anniversary of his birth. 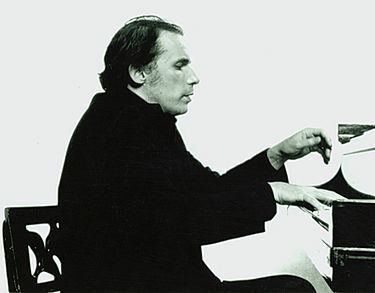 Give yourself a gift by listening to Glenn Gould. Bach’s Goldberg Variations is a good place to start.